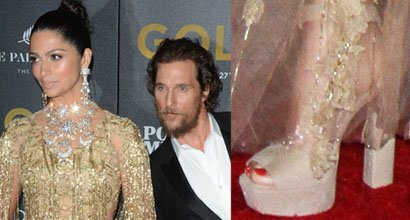 Scroll down to see celebrities wearing dresses and footwear by Marchesa, an American brand specializing in high-end womenswear based in New York City. Marchesa is an Italian noblewoman ranking above a countess and below a princess. What is Marchesa Notte? Created in 2006 by Marchesa designers Georgina Chapman and Keren Craig, Notte by Marchesa speaks to the younger crowd of fashion enthusiasts. Who owns Marchesa ? It is privately owned by founders Georgina Chapman and Keren Craig. Who is Marchesa named after? The brand is named after Luisa, Marchesa Casati Stampa di Soncino (23 January 1881 – 1 June 1957), an Italian heiress, muse, and patroness of the arts in early 20th-century Europe. Where to buy Marchesa You can buy Marchesa bags, bridal dresses, wedding gowns, perfume, jewelry, and shoes at Amazon, Farfetch, and Nordstrom. Amy Adams attended the National Board of Review Gala held at Cipriani 42nd Street in New York City on Wednesday…. 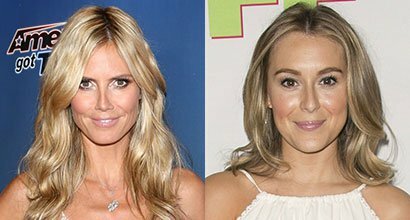 Who Looks Best in Christian Louboutin “Pina” Sandals: Alexa Vega or Heidi Klum?